Have you ever dream to export or import your data to Excel in 1 minute? and do much more in Excel from your Clarion application! These templates and methods allows the programmer to manipulate data on both sides. Data can be read from the Excel sheet, modified, and then written back to the sheet, formulas can be added to the sheet, macros can be added and executed. 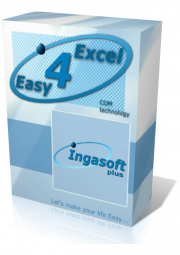 This release is the first EasyExcel release, that uses COM technology, so you receive now a full control over Microsoft Excel. EasyExcel supports all Excel version that support COM automation (NOT starter, student or home version). You'll get libraries (LIBs and DLLs), templates, examples and complete documentation for the class and templates (CHM file).